Challenge: Cook a 4 kilo / 9 lb grouper (merou en français) in a miniature boat oven, in a salt crust, for eight guests aboard a luxury yacht during the Grand Prix in Monaco. I’ve never done this before, so I am a wee but concerned. Not nervous, because hell I am a chef, and chefs don’t get scared. We attack! First task: acquiring the salt. The boat was located right across from Monaco Yacht Club, inside the race track. So basically we were closed in from 6am to 7pm each day. Finally on Friday, the day before “the big cook,” the tracks closed early, about 3pm, and I set off to the grocery store. It took me a while to navigate all the roadblocks…then I hauled a caddy with 10 large boxes of large crystal salt (gros sel); as well as two other large shopping bags of food. I might’ve been trapped for days on the boat with no opportunity to shop, so I bought as much as I could carry. I really did all my exercise for the day hauling everything back to the boat. Everytime I am lugging stuff to the boat, to the train, across countries, continents, airplanes, between friends’ houses I curse myself. For bringing so much. And I vow that next time I will bring less, I will be more efficient, more streamlined. I will be the perfect traveling soldier. But alas, I am not quite there yet. I am a mobile jet setter, love it or hate it, and with each trip, I am fine tuning the perfect travel bag, items that can do double duty, mobile, light, with stuff I wouldn’t be sad about losing. (It hasn’t happened yet. I am a backpacker disguised as a suitcaser). So, I finally get to the boat; my guests about ready to have apero. I pump that out; then get to Freddy, my grouper. He was living in my home-sized freezer for the past week; occupying all my precious cold space. I took him out the night before, where he rested quite nicely in the sink, slowly thawing out, rejoining us in the ambient temperature world. He stabbed me in the center of my left palm before he went in the freezer, but he was cooperating quite nicely now. We got him from the local fisherman (pêcheur) in St. Jean Cap Ferrât in France, along the Côté d’Azur…our home port. I researched on the internet how to do the salt crust. There are three options: 1) crust with just salt; 2) crust with egg whites; and 3) crust with whole eggs. Additional herbs optional. I prefer a flaky white fish like seabass or trout, but you can try a firmer fish like grouper or Mahi Mahi. Preheat your oven to 220 degrees Celsius. Cean and gut the fish, but leave the scales on to keep the fish moist. In a large bowl, mix 4-5 boxes of salt (about 1 kilo of salt to 1 kilo of fish); along with 2 eggs per box. The texture should be like wet sand. Pour half the mixture on a large roasting pan. Place your cleaned whole fish on to. Stuff the belly with herbs; I like thyme and lemon; try orange for a different kick. Cover the rest with the rest of the salt mixture; then pat everything nicely together over the body of the fish (you can leave the tail and head uncovered). Throw that baby in there and let it cook. About 15 minutes for a small fish, up to 40 minutes for a fish larger than 4 kilos (like Freddy). To check if its done, stick a knife in the center of the fish, piercing the salt crust, and touch the knife to your upper lip. If it’s warm-hot, your fish is done. Drape some herbs and extra lemon around the platter; and present your masterpiece table side. Crack open the crust, let them see inside. Rush back into the kitchen; remove the salt, and filet the sucker. 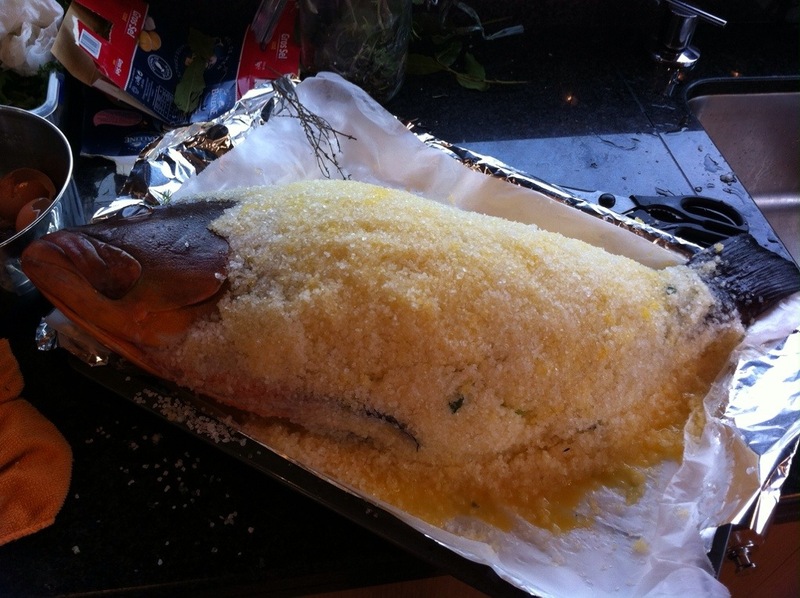 Benefits of the salt crust: perfectly seasoned fish, not much faffing around. Guests looooove it. My guests actually pounded their fists on the table and screamed “Ivy!! Ivy! !” In my honor and celebration. Even the one guy (from the UK) who doesn’t like fish (unless it’s breaded)…even he liked it. Plus it’s like a celebration of the olden times. Downsides: your galley gets completely trashed with salt, bits of scales and greasy fishy bits everywhere. Or at least mine did as I fought with Freddy and his firm, firm flesh. He was wiggling everywhere. It took me two days to get every bit of salt out. Also, now that your captain knows you can do this, he asks you to do it again two weeks later. Thank goodness the fish was a lot smaller. And this time around, I had plenty of salt on board.